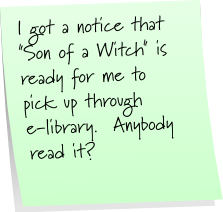 You'll have to tell me how you like "Son of a Witch"... I LOVE the play Wicked but cant make it through the book... thought it was awful. Just stopping by to do a little catching up. 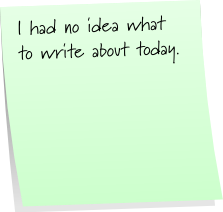 I've always loved Post It Note Tuesday! 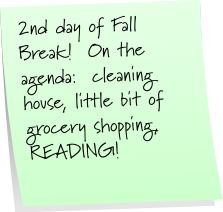 Enjoy your fall break and your book. Let us know if it's good. Great job! 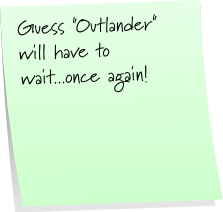 I think post-it notes make Tuesday's post the easiest to write, lol!!! Have you read The Hunger Games? I started it over the weekend but didn't get very far. I'm afraid I'm not going to like it. I guess I'd like some encouragement from someone who did read it and who liked it. I haven't read it, hope you enjoy. I am so jealous of your fall break. They don't do that around here. It sounds wonderfully awesome. Have fun! Hello I am visiting you today - I saw you on Sweet Tea's blog and I love her. I live in GA - so we are neighbors. I want to know how you get the stickies on here! I love them. Hunger Games-- absolutely loved it--if only because it reminds us how corrupt a government can become. I think we all need to learn to "speed clean". Enjoy your break, and your book! Fall break??? Already??? :) Enjoy!!! I haven't done post it notes in a long time. Is anyone linking them? Chatty is a blog friend of mine and her posts are always fun and inspirational!